Christianity isn’t about gritting our teeth and trying to be good. It is about surrendering to Jesus as the king of our lives. 2 Samuel #4 . 2 Samuel Chapter 5. After Abner died, his coalition fell apart, and the leaders of Israel came to David to ask him to become their king. 1 Chronicles 12:23-40 describes this incident in more detail than 2 Samuel 5. (By the way, it appears that the books of Samuel are more chronologically-oriented than 1 Chronicles. Also, the writer of Samuel is far more critical of David than the writer of Chronicles.) In Chronicles, specific leaders and groups of leaders are named, showing that a large number of influential people from all twelve tribes came to make David king. Chronicles records that they feasted and celebrated joyfully. Back to the text in 2 Samuel. These leaders gave three reasons why they wanted to finally receive David as their king. First, they said, “you are our flesh and blood.” They were saying, “you aren’t a foreigner, that we should fight you – we are all Israelites after all. Judah is part of Israel.” They were recognizing that Saul’s attitude was wrong. Second, the leaders said to David, “you were the one who used to lead us out to battle, and bring us back safely.” They are remembering his faithful service to Saul, which perhaps David thought had gone forgotten and unrewarded. David had already been their leader in the past, though that service was not officially acknowledged up until now. As a leader, he had accomplished great victories, and brought the troops back more safely that he would have in defeat. Finally, they were acknowledging that God himself had chosen David to be their king. They were at last submitting to God’s plan for his people. They said: The LORD also said to you, ‘You will shepherd My people Israel and be ruler over Israel.’ ” They are acknowledging at last that God had a call on David’s life, and it was God’s will for him to be their king. As always, I think it is helpful when we read to the Old Testament, to ask “where is Jesus here? How does this reveal Jesus to me?” Well, Jesus, is the rightful king of every Christian. That is God’s desire for us. He should be the ruler over everything in our lives. But even though David was chosen by God to be the king, he waited patiently until the people accepted that and submitted their lives to him joyfully. Even though the Lordship of Jesus is God’s will for us, we have not all submitted to that. Jesus is waiting patiently for us to submit all areas of our lives joyfully to him. Does Jesus determine how you spend your money? Does he determine how you spend your time or energy? Is it the words of Jesus that you speak to you family and friends and co-workers? Jesus is our flesh and blood. He belongs to us and we to him. In Jesus, God became more accessible, more understandable, by taking on, forever, human nature. He has a right to be king of humans, because he is a human. He can sympathize with us and understand our struggles. Second, Jesus is originator and creator of everything. He is our protector and sustainer. He has already helped us, already served us, already kept us safe. He has already suffered and died on our behalf. By virtue of how he has already served us, he deserves to be our Lord. Finally, it God’s desire that we surrender entirely to Jesus (Philippians 2:9-11). He is the rightful and chosen king of our lives. This is God’s desire – that we allow Jesus to live his life through us, as the owner of our lives. If you feel a little frustrated for David that it took the Israelites so long to accept what God was doing, consider accepting what God wants for your own life! Verses 6-12 of 2 Samuel 5 tells us about Jerusalem. Up until that time, Jerusalem was controlled by a pagan tribe of people known as the Jebusites. They were a sub-tribe of Amorites – one of the non-Israelites tribes that the Israelites were supposed to conquer and drive out. However, there were steep ravines to the south, west and east of Jerusalem, and at the top of the slope, the walls began. It was a formidable fortress. The Israelites had defeated several kings of Jerusalem and had burned the city itself once (perhaps before it had walls), but they had never managed to capture it and hold it. Now, with walls, the Jebusites are confident that no one could take it. We should understand that it was much smaller in those days. The Jebusite City of Jerusalem covered only about 12 acres on the very top of the end of the ridge. This area is known as Mount Zion. 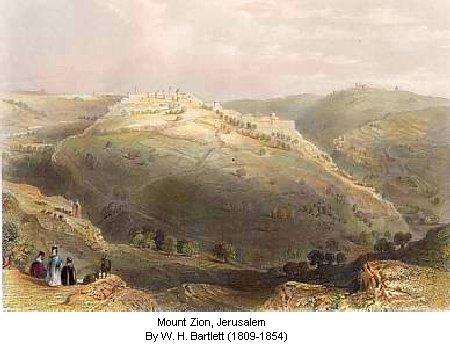 In the following years, the city spread out greatly, and in modern times, Mt Zion is just one hill in the very large metropolis that is Jerusalem. In spite of its reputation and history of being impossible to conquer, one of David’s first acts as king of all Israel was to attempt it. David shows here that he is smart and cunning, as well as courageous and strong. Water for the city was collected from the spring of Gihon, which was near the bottom of the Kidron valley, on the east side of the city. There was a shaft or tunnel that went through the hill down to the spring, so that the Jebusites could get water without going outside the city walls. David learned of this. It is quite possible that he observed Jebusites drawing water there back when he was worshipping God at the tabernacle, when it was kept across the Kidron valley, at Nob (now known as the Mount of Olives). 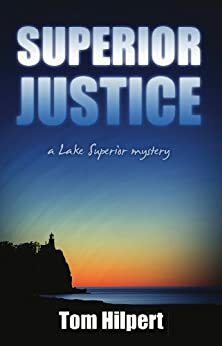 In any case, he determined that the way to take the city was to infiltrate men up the water tunnel. It was a very narrow space, and the men would certainly have had to go one by one, gathering at the top before the assault. That is what David did, with his nephew Joab leading the way and killing the first enemy. By doing that, Joab cemented his position as commander of David’s armies. 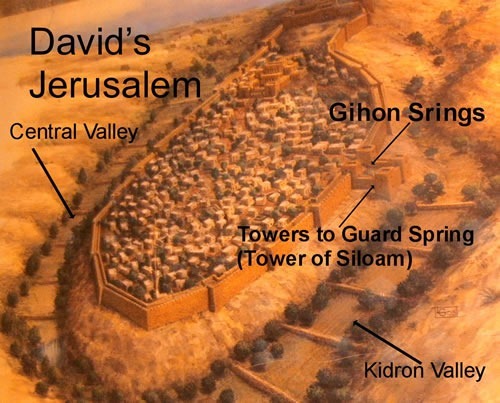 The city fell without any destruction to the walls, and David made it the new capital of Israel. These are the actions of a brilliant leader. First, it was terrific military strategy to make use of the water shaft, and attack the Jebusites from within the city. Second, Jerusalem was still an impregnable fortress, an excellent choice for the seat of government in troubled times. Afterward, David built towers covering the entrance to the water shaft, so no one would take the city the same way he had. Third, it was an extraordinary diplomatic move. David was from the tribe of Judah and up until this time, his capital was a city of Judah. Saul had been from Benjamin, and had made his home town into the center of power. But Jerusalem did not belong to any of the tribes – it was held by the Jebusites. So when David captured it, it became truly an Israelite city. No tribe could claim it, and no tribe would be offended that it was the capital city. It belonged no one, and yet at the same time, to everyone. It was not quite centrally located, but it was close. By the way, some secular archaeologists dispute the existence of David (they choose to ignore the incredible documentary reliability of the Old Testament). However, a water shaft from the spring of Gihon leading up to Mount Zion was discovered in the 1860s. It doesn’t have David’s name on it, of course, but once more, the Bible told us of it before archeologists discovered it. 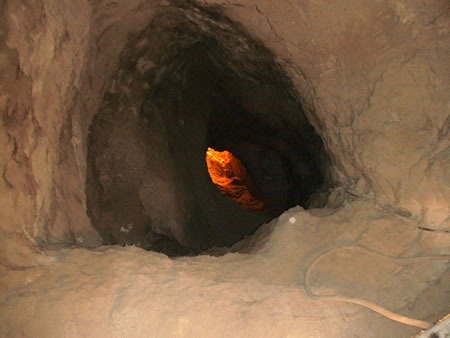 In the 1980’s archaeologists were convinced that this shaft was dug after the time of David. But more recent work suggests that the water tunnel originally occurred naturally, long before David’s time. It also now appears that it being used by humans before the time David came along. The point is, the book of Samuel describes things that are actually still there. In a sense you might say that if the bible is right, there should be evidence of a water shaft in that location, and sure enough, there is not only evidence, but the actual tunnel itself. Now, once more, let’s ask the question: How does this part of the text reveal Jesus to us? What does it say about him, or our relationship with him? The Jebusites thought they were invulnerable. They had an impressive fortress. But one crack, big enough to fit one man at a time, led to their downfall, and then the city belonged to the king. Jesus is a warrior like David. He is wise and cunning like David. If there is just one little crack, one place where you can say “yes” to Jesus, he can exploit it, and use it to conquer the evil in your life. He can get to people that you think are invulnerable to him. So if you are concerned about someone else in your life, I say trust him. Ask him to do his work on your loved one. And if the problem is in your own life, I say, simply give him a “yes.” Find some way to say “yes, Jesus. I don’t think I can ever give up drinking [or whatever], but I give you permission to try and take over that part of my life.” Watch what he can do if you just give him the tiny crack of your willingness. So, where you can, welcome Jesus as your king. Surrender your life to him, submit to him. Let it be his life from now on. And where you can’t do that, where there is a fortress around your heart, just give him a tiny crack. Just be willing for him to make the attempt. How is the Holy Spirit speaking to you today?